I thought I would share my E13th Universal tuning and setup. It has 5 pedals and 7 knees. Can also be done with 7 pedals and 5 knees. Every pedal and knee lever works with each other whether playing traditional E9th stuff or C6th type things. The best thing is you don't have to think in different keys like with E9/B6th or Bb6th universal tunings. I want to eventually put this on an S-12 tuned to D.
Thank you Johnny. I've been hoping you would post this. RKR changes strings 10 and 11 to match the C6th strings 8 and 9. That might be a good candidate for a "lock lever". It will sound more "C6th-like" when you lower the basic tuning from E13th to D13th. I'm playing a 10-string D6th with A&B pedals added. The timbre is very nice for both styles of playing. Bob, the LKRO is also the C pedal when combined with A&B. LKLI is as lowering the 3rd string (C).They all work in tandem. Bob the way all the pedals are laid out there is no need for a lock lever. Its so easy to seamlessly go between styles. I know. Some people like a lock lever for convenience, to keep their leg from getting tired. When playing a lot of swing, they might want to hold that RKR for a long time. That's why some people like a lock on E lowers of the E9/B6. Others find the lock idea limiting. Different strokes, I guess. I'll need to invest some time looking at this to really grok it. b0b has big head start on me in copedent analysis. (That's my understatement of the day). Is this pretty similar to Zane Beck's U12? I had custody of a 6x5 BMI with one of his copedents some years back but didn't make much progress with it. That C# in the middle did throw me off my five or six E9 licks though. Here is one of Red Rhodes's tunings transposed up a half step to E.
Because it is up a half step, the high B on string 2 is probably impossible; D or D# would work well there. There are a lot of similarities to Johnny's E13. When I tried E13, I raised the C# to D with the A pedal. That way I never had to worry about muting the sympathetic vibration caused by the two identical C# notes. But neither Red nor Johnny seem to be bothered by that. I mute it with my pinky when necessary. Sometimes I want the unison effect. 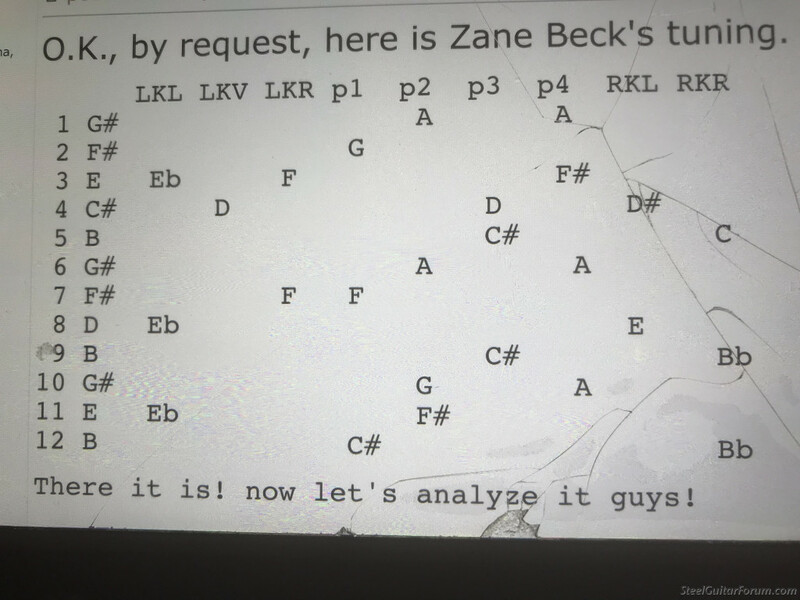 I have not really seen Zane Beck's tuning. I sure loved his playing though. Bob's D6th is interesting as well. I'm going to change strings today and tune mine down to D and see how I like it there. I found ZB's copedent over on the BMI website but failed trying to put a link in. Oh well. It is definitely E13, but with a low B and no chromatics. Quite a bit simpler than yours, Johnny. It does raise the middle C# to D on the A pedal like Earnest mentions. With that big chunk of pure E9 on strings 11 thru 6 and the chromatics still there, I think this E13 of yours would be a lot easier for somebody coming from E9 to get up to speed on. I think so. And when you hit the RKR it becomes like the low end of C6th with a D in the middle of the tuning. From the forum here is Zane Becks copeadent. Zane played country or Jazz with this tuning. He would always play his steel. He would use a drum machine an play jass tunes he wasn’t one too play riffs an licks he would play songs from start too finish. Amazing steel player. Posted 9 Feb 2019 9:51 am E13th Universal kinda sorta!!! What's the logic of the location of P1? Why not P4 or P6? On a side note I started a post years ago about U12 setups. Buddy replied and stated if he was starting over knowing what he knew. He would start with an E13th tuning with the standard E9th setup. Then put the 6th pedals in the center of the guitar like a standard D10. I wondered that myself. It's the C6th "boo-wah" pedal, so shouldn't it be on the far right?. Then I remembered my extended E9th, originally copied from Winnie Winston who lowered his 12th string E to C# on his F lever. It was wonderful for a low root in the A+F position. Now I'm looking at my D6th wondering if I should re-rod the whole thing to move that from P6 to P1. Johnny, could you explain your 11th string P4 change? On my D6th I raise G to G# there (consistent with C6th logic for P5), but your D chart shows a Bb. Certainly not to offend anyone,,this is one of the MOST interesting threads to me and I'm sure many others,,,but,,,wouldn't it be better,,or less confusing to talk in terms of interval numbers,,,that way it wouldn't matter whether we are tuned in E,,or C,,or D,,,(timbre would just be a matter of personal choice) ,,just the interval that all other strings are relative to the root. Just a suggestion,,,and not to offend far greater thinking minds than me. Hey b0b, with RKR whole step lower, and a half step raise on P4, it winds up at G#, III of the II7 chord like C6 P5. This looks better and better the more I study it. Having that second scale degree on string 8 would widen your grips for big chords but it would be really simplify single note playing in the middle of the tuning. Johnny, If a person was limited to just 5 KL, which 2 KL could be given up and still have an "almost" full capability on your tuning,,,maybe compensate with some slants?? I wish that I would have taken the time to pick your brain while you were here in Branson. I've always had this theory that there wasn't enough mechanic players as the steel developed so levers were often added without regard to the final picture. Mechanic/ players like yourself have the ability to move and try all combinations. Great Job, Great Guy, Great Player. RKL is a common E9th lever that many people do without. It raises the first string F# to G# and lowers the middle G# to F#. You could raise the first string half a step on P1 (like Buddy did on P8) and get the full step with a slant, like Lloyd does. I'd miss having that middle G# lower, though. LKV is part of the modern "Franklin pedal" (E9th lower B to A) and is also a change that some C6th players have (C6th lower G to F). It's not strictly necessary in my opinion - very few E9th or C6th instructional tabs use it. Thanks b0b,,,glad we've got guys like you and Johnny to help make sense of all these possible combinations!!! !